I have working Bluetooth on my PC and I have no problems when actually transferring files, however, I need to go into a control panel menu and allow Bluetooth file sharing every single time I want to transfer a file. This is very annoying because I transfer files with bluetooth multiple times every day. I know that Windows 7 had the option to add trusted devices and automatically accept files from them, but I can't seem to find the option in Windows 10. It was in the Bluetooth Settings menu under the 'Share' tab, but that tab seems to be missing. Is there a way to force it in Regedit or something? I have tried my PC's built in Bluetooth, along with two Bluetooth USB dongles and I still have no option to enable automatic file transmission. I have also updated all the Bluetooth drivers I could find, and the Bluetooth Support Service is definitely running. I believe the configuration you want was removed from Windows 10 because it is insecure. Even if Windows allowed you to do this I would still tell you not to do it. Bluetooth is an inherently insecure protocol, so applications (and operating systems) must take additional steps to produce a secure implementation. I think the concern is that someone could spoof your "trusted device" and send malicious content to your PC. Remember, in Windows there have been multiple vulnerabilities that are triggered by simply viewing a picture, pdf, or office document. You want that extra step because if the confirmation popped up when you weren't expecting it, you would think "I'm not sending a file to my PC with BT right now..."
Not the answer you're looking for? Browse other questions tagged windows-10 drivers bluetooth or ask your own question. Qualcoom Athereos Bluetooth adapter, automatically accept any incoming file? 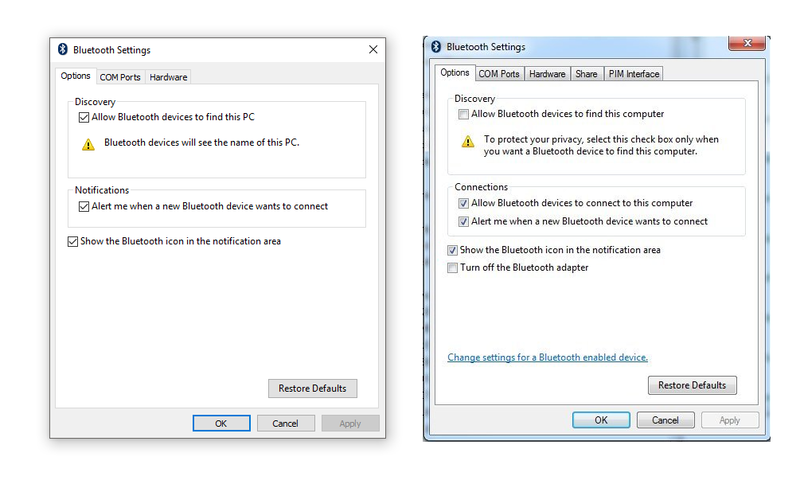 How to re-install Bluetooth drivers on Windows 8.1 without manufacturer specific instructions? How to make bluetooth drivers work?